This recipe was given to me by a Spanish ex Minister who happens to be an outstanding cook (and great host as well, in addition to being an outstanding lawyer) It is part of the culinary heritage of the Sefardi Jews who were expelled from Spain centuries ago at the time of the brutal Inquisition. I am not sure at the time they would have used salmon or rather white fish. In any case it goes work well with a salmon nowadays. Put the oil on a frying pan over medium heat. Add the onions, lower the heat and wait for 6-8 minutes until they get soft. Add the olives and cook it all for another 5-6- minuets so that you get a mellow mixture. Add salt and the parsley and mix well. Preheat the oven at 200 degrees. Grease an oven tray lightly. 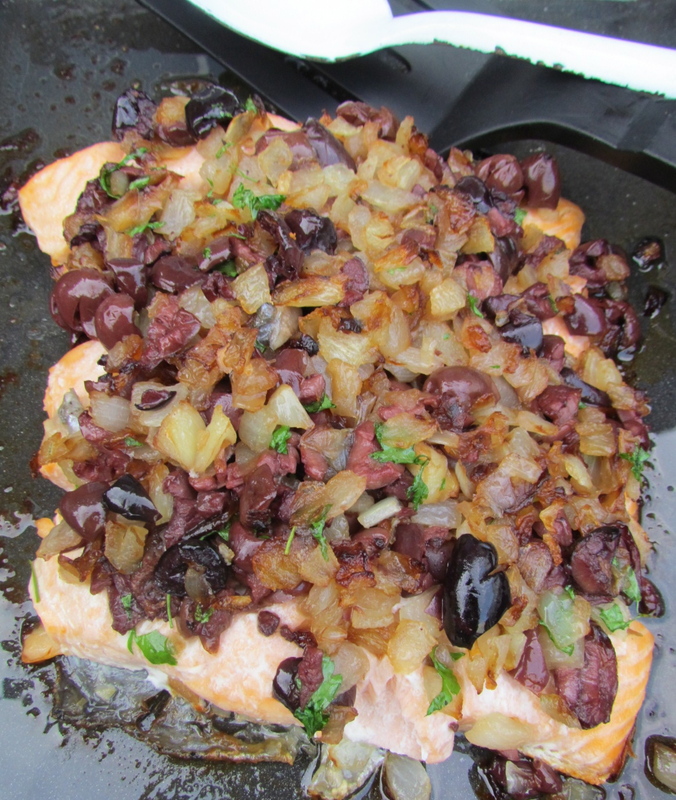 Salt the salmon steaks and put them on the tray (skin side down) Pile the onion and olives mixture on top of the salmon (it is easier to do this if you put the steaks close to each other and just pile up all the mixture on top). Sprinkle with the lemon juice and bake for 13-15 minutes. If you like it very well done then bake for 18 minutes - but be careful with the timing because dry salmon is really not nice to eat.